Driving in Vietnam can be a hair-raising experience. Traffic here is much worse than in Thailand and it seems that there are far more scooters on the roads. Roundabouts and intersections are especially tricky to navigate. 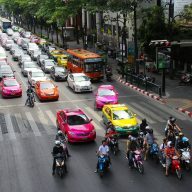 Hardly anyone puts their indicators on, people talk on their phones, never look in their mirrors (if they have them at all) and beep at each other constantly, which can be stressful for someone, who is driving in Asia for the first time. Roads outside of the big cities are treacherous, too. Surfaces are bumpy and covered with dust that constantly gets into your eyes, lorries overtake without a care in the world and you never know when someone decides to turn or change a lane. But driving in Vietnam is also fun and gives you a sense of freedom. It allows you to see the country on your own and to experience it without spending money on organised tours. Hundreds of visitors hire, or buy, scooters here and set off on adventures all over the country. This post is to help you to rent a ride on your own and to feel more confident on the road. 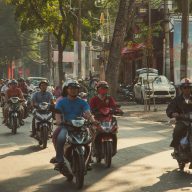 How to rent a scooter in Vietnam? 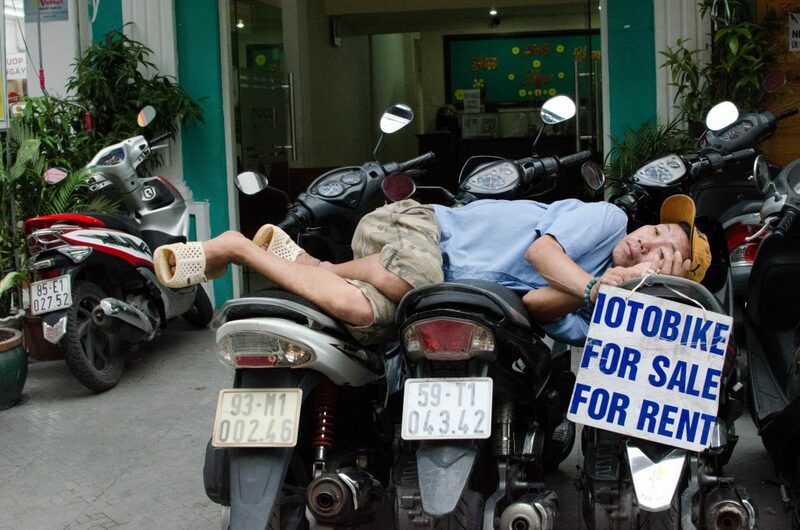 Renting a scooter in Vietnam might be a challenge, if you’re doing it for the first time. Very often rental places charge more than a standard price for something that is, to say the least, a little old. There are a few rules you should follow to make the process easier. 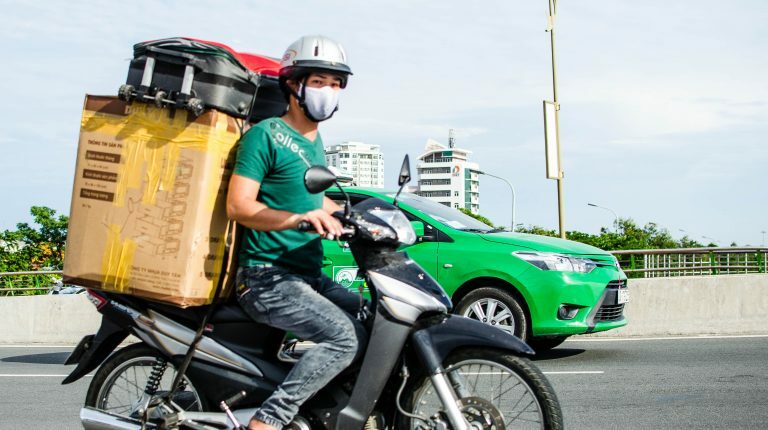 It costs around 100,000 – 150,000 VND per day to rent a scooter ($4,50-$6 USD). You can negotiate a better price if you want to rent the scooter for longer. Take your passport with you and remember that the rental place will want to keep it until you give the scooter back. If you want to rent it for longer, then you might be able to negotiate leaving a larger deposit money. The amount of deposit varies from place to place and depends on how long you would like to rent the scooter for. Check your contract carefully. It should be in English and have all necessary details: deposit amount, rental price, when you should give the scooter back etc. Check your ride carefully for damages. If you notice anything, tell the staff about it and take a picture of the damage. Go for a test drive. The rental place should allow you to test drive the scooter. Motorcycles and scooters are quite old in Vietnam and the petrol they use damages the engines. 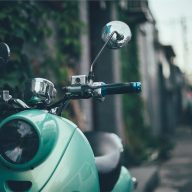 Very often scooters make a loud noise when slowing down, or stopping, which might be sign that there’s something wrong. Remember to check the horn and breaks as they will come very useful. Discover Vietnam on two wheels! How to drive a scooter in Vietnam? Traffic in Vietnam is an organised chaos. It seems terrifying and busy, but it has a couple of rules worth following. Observe other drivers first. Take a motorcycle tour, or a motorcycle taxi, and watch what the driver does and how Vietnamese people survive on the roads. I usually learn from observing others first. Always wear your helmet. You will see that everyone in Vietnam has them. The ones that you will get at the rental shop are cheap and not very well made. You can buy better ones at authorised dealers. Don’t leave your helmet unattended as they get stolen and then re-sold at local markets. You can take them with you, or leave it in the seat compartment. Drive slowly. Start from around 30 km/h and try to keep some distance between you and the other bikes. Always stick to the right side. When changing lanes, look in the mirrors and behind your shoulder. Beep, beep and beep at everyone, especially at intersections and roundabouts, and when you overtake other vehicles. This is a warning sign for others, so they don’t turn, or change lanes, suddenly. Remember that the person, who drives out from a side street into a main street has a priority, so many people don’t look around when they join the traffic. Be aware of other cars driving on other lanes. Look at the arrows on the road if you are driving on a road with three lanes. Many times people driving on the left lane are allowed to turn right at the very last moment. 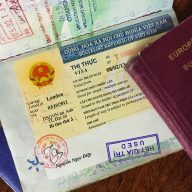 It is illegal to drive in Vietnam without a valid driving license, but it’s Vietnam… So, carry your international driving license with you or around 500,000 VND to ‘pay’ your fine when caught by police. I heard that if you talk to them in French they will let you go as no one speaks it in Vietnam. Try it out and see if it works. Good luck!